I am a deacon at a church in Hickory, and I liked both letters Dr Pardue sent to The Hickory Daily Record. More pastors have to speak out if we are to turn around this moral free fall our nation is in. It was clear from before the first word penned by J.D. 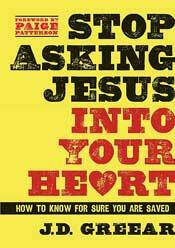 Greear that Stop Asking Jesus Into Your Heart: How to Know for Sure You are Saved was going to be no ordinary book. Five pages occupy the front of this little book – five pages full of endorsements from well-respected pastors, professors, and religious leaders. Within the endorsements it is clear that this book forces its readers to carefully examine the nature and doctrine of salvation. Greear opens the book with, and subsequently weaves through, his own story of salvation. His story brings practical application to his thesis that assurance of salvation is found in our present posture toward Christ. Our faith and hope rests on His sacrifice. Greear jokes that he must hold the world record for “asking Jesus into his heart.” As a young man he was plagued by doubt and a lack of assurance. This book recounts his discovery of the wonderful assurance that Christ wants His people to have. Stop Asking puts it very simply, either we believe or we do not. Everything else will flow out of whichever of these two postures we dedicate ourselves. In this, we accept we are dependent on Christ or we rely on ourselves. Understanding we are unworthy shows us we don’t deserve anything from, and have nothing to offer, God. Moving further in his encouragement toward assurance, Greear spends two chapters dissecting the two pivotal words associated with salvation: repent and believe. Greear calls these two sides of the same coin. “Jesus lived and died; we believe He lived and died for us and we choose to rest our hopes for salvation upon Him,” he writes. So often, he points out, many people only have a brief moment in time, when they said a prayer or walked an aisle to hold on to as their hope for salvation and an eternity with Christ. This reality causes Greear to state boldly that, “your present posture is more important than a past memory.” For me that statement draws my mind somberly to the remembrance of so many funeral services I have conducted when the testimony of the one lying prostrate in front of me was solely based on a very distant memory. Greear goes on to point out that belief is inextricably coupled with repentance. Repentance is not simply outward actions, but it is “fundamentally a motion of the heart in which we abandon our posture of rebellion and adopt one of submission toward Christ. Repentance is evidenced by outward action, but it does not equal that.” Repentance is not perfection, partial surrender, becoming religious, simply confessing or feeling sorry for sin, or even praying a prayer. Repentance is a heart change where settled defiance is eradicated, Jesus is followed, and the Spirit changes our desires. Greear closes the book by considering eternal security, and his explanation is concise, pastoral and sobering: “The full doctrine of eternal security is that once we are saved, we will always be saved, and that those who are saved will persevere in their faith to the end. It is true that ‘once saved, always saved;’ but it is also true that ‘once saved, forever following.’” The scriptures provide both assurances of salvation and warnings against falling away. Greear contests it is vital for both to be present in pastoral ministries. For those still with questions, Greear lays out a simple observation: the Scriptures point to our love of God and our love for others as evidence of our salvation. These are present in the heart and life of the believer. I agree that it would be expedient to keep this close at hand as it is a most helpful tool to encourage those who are often heavily weighted down by doubt. We fly from Charlotte to Munich, and then down to Vienna next Wednesday. We wanted to say thank you to all of you who have been walking with us through this long process to get to Vienna. We would not be to this point without your faithful giving and prayers. We wish that we had the time to visit with all of you before we leave. Currently we are $600 short of the monthly support that we need. Our organization has cleared us to depart for Austria next week. However, if we cannot raise these funds soon, David would have to return to the States in 6 months to spend time raising the needed funds. This would obviously be a difficult disruption for our family life, as well as for language studies. God has provided through so many of you, and we know that He will continue to do so. Please continue to pray about this. If you aren’t partnering with us currently, would you consider partnering with us as we join in what God is going in Vienna, Austria. The giving information is attached. If you have any questions, give David a call at 864-706-1963. Last week I wrote a letter that appeared in the Hickory Daily Record. I’ve received a lot of feedback from this letter. Many of people have been very encouraging, especially people that know my heart. However, today I received a very offensive voice mail at our church from a couple in the Hickory area. The language, and to be honest, the ignorance displayed in the voice mail have lead me to decide not to post it to my website, as I did with positive feedback. Everyone who knows me is keenly aware that I have a great love for our country. I am the son of a Vietnam Veteran and have heard first hand of the hate that is often thrown on people who have served and loved our nation. However, I have a much greater love for my Savior. Our nation is going in a direction that brings my heart low. We have aborted babies by the millions, we incur indebtedness on our children that we can never hope to repay, and we call many things righteous that God has declared sin. I seriously question how anyone who claims the name of Christ can be unaware of these facts. Whatever it is we once were or some think we may have been, our nation is in trouble, but the Kingdom is not. The Kingdom of Christ is “imperishable, undefiled, and unfading.” The Kingdom is a place where life is cherished, our debt is forgiven, and the righteous King reigns forever. I just want thank you for your thoughtful letter that you wrote to the HDR. It is encouraging to see an opinion based on the Scriptures and not the opinions of men! My middle son is a student at Gordon Conwell Seminary in Boston and this is a topic he and I discuss often. We always come back to The Kingdom of God and what it is when discussing this topic, and you outlined it very well for us! Thank you for your ministry and biblical approach to life as we serve a great Savior who’s kingdom is “not of this world”. I want to ask for your prayers for my family. About two and a half weeks ago, on Father’s Day, my mother informed me that she had received negative results from a recent medical test. Since then we have found that she has a tumor in her lung that will require surgery. That surgery is currently scheduled for next Wednesday, July 10, at Frye Hospital. I had planned to mention this on Sunday as we were gathered for worship, but, since my mom was with us, I figured I would become a bumbling mess and decided not to. However, my mother has taken this news much better than the rest of us (which is not out of character for her) and has shared this with someone of you already. I ask that above all else you take time to pray for my mother, father, sister, and the nine grandchildren. We are not entirely sure of the prognosis as of yet, but I am confident that our God is a big God who kills cancer. He is “able to do far more abundantly than all that we ask or think, according to the power at work within us” (Ephesians 3:20). When we consider our God, we know that “the works of his hands are faithful and just; all his precepts are trustworthy” (Psalm 111:7). Rachel and I appreciate everything that you have done for us since we arrived here in Icard and I am grateful that as we go through this difficult season you will be with us. As far back as I can remember I have heard this country of ours referred to by some as a “Christian nation.” When I was pretty young, I was skeptical, but assumed that I had just missed something. In more recent years the mantra has become that we were once a Christian nation. This seemed to fit better but, to me, never seemed to be a satisfactory description of the history of these United States. This week the Supreme Court took further steps to solidify my now concrete conviction that we are most certainly not a Christian nation and has strengthened my cynicism about the notion we ever were. Our country was founded to be a nation of independent people. The Kingdom was founded as a nation of dependent people. Our country holds to the principle of rugged individualism. The Kingdom is a community where others are put before self. Our country holds to the rule of law. The Kingdom holds to every word that comes from the mouth of God. Our country encourages justice that is blind. The Kingdom has an omniscient Savior who is just. Our country encourages her citizens to follow their dreams. The Kingdom says deny yourself, take up your cross and follow Jesus. The Kingdom promises a resurrection to life. Our country confers equal protection under the law. The Kingdom proclaims that no man is secure except through Christ. Our country gained her independence with muskets and cannons. The Kingdom was inaugurated with nails a cross and an empty tomb. Marty Jacumin, pastor of Bay Leaf Baptist in Raleigh, will nominate Micheal Pardue as president of the Baptist State Convention of North Carolina’s (BSC) Pastor’s Conference during the 2013 Pastor’s Conference in November. Pardue and his wife of nine years, Rachel, have three sons, Elijah, Jason and Kyle and three daughters, Kristen, Addelyen and Lilyanna. He is native of Taylorsville where he grew up at East Taylorsville Baptist Church. He answered the call to vocational ministry at 13. He has been the pastor of First Baptist Church in Icard since February. He has previously served in ministry positions in churches in Ellenboro, Bostic, Shelby, Kings Mountain and Taylorsville during his nine years of ministry. Pardue holds a bachelor’s degree in theater arts from Gardner-Webb University in Boiling Springs, a master’s degree in Christian ministry from the T. Walter Brashier Graduate School at North Greenville University in Greer, S.C., and a doctor of education degree from Southeastern Baptist Theological Seminary. In November 2009, he was elected vice-president of the BSC Pastor’s Conference and to the BSC Board of Directors in 2010. Earlier this year he was elected to the Board’s Executive Committee.